Amsterdam, The Netherlands – Philips Lighting has today announced the launch of a new, complete and innovative water disinfection solution, Philips InstantTrust. This solution is based on cutting-edge disinfection technology optimized for point-of-use applications. For the first time water can be disinfected instantly, efficiently and independent of water temperature. Many consumers are concerned about the quality of drinking water, because the microorganisms present in water can make them ill. In emerging countries these concerns may be due to the water infrastructure, but also in western countries incidents can cause contamination with microorganisms. In North America alone 85% of child sickness and 65% of adult diseases are a result of water borne viruses and bacteria . 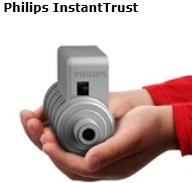 The new Philips InstantTrust solution can be integrated into any point-of use application including taps, water pitchers, under-the-sink water filters and portable counter-top systems. It solves many of the limitations of current UV disinfection technology and enables equipment manufacturers to provide consumers with access to safe drinking water: anytime, anywhere. Philips InstantTrust is so compact in its size that it allows manufacturers to integrate the solution into smaller equipment than ever before and gives them stylistic freedom to design sleek products ideal for the small and modern home. Furthermore, the revolutionary solution works instantly to produce safe water from the first second onwards, eliminating waiting time. It is unique due to its ability to work independently of water temperature and because it can be used for integration into both hot and cold water systems. Philips InstantTrust is ideal for instant disinfection of small quantities of cold water (up to flows of approximately 4 liters/minute). Philips Lighting has been at the forefront of UV technology for many years and has helped equipment manufacturers across different sectors including residential water, municipal drinking and waste water, industrial water, swimming pools and fish ponds to design effective water purification equipment by developing innovative and reliable UV solutions.